Applicants have until July 15 to submit design ideas for the side the building at 80 Exchange St., where a renovation will remove the popular one there now. Wanted: A courageous Portland artist with a big idea. 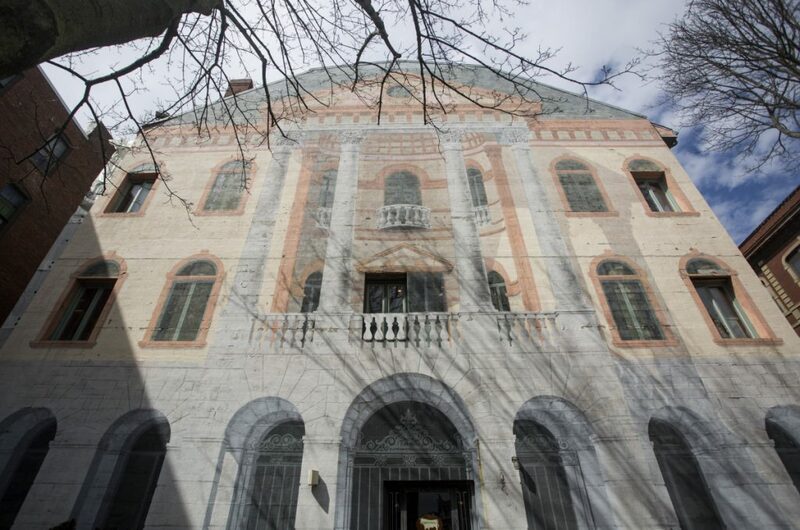 The owner of an Old Port building will help raise up to $80,000 to replace a long-loved trompe l’oeil mural that is being lost to a $2 million renovation of the building at 80 Exchange St.
Fathom Cos. is seeking proposals from Maine artists, or artists with ties to Maine, to replace the mural at 80 Exchange St. For more information go to fathomcompanies.com /80ExchangeMural. The developer, a real estate and hospitality management company that owns and operates The Press Hotel up the street, is requesting proposals to replace the mural and has pegged the budget at between $40,000 and $80,000. That money will be raised privately. The building at upper Exchange Street marks the beginning of the Old Port, and the four-story facade with the mural faces Tommy’s Park. The current mural, which was painted in 1985 and is now hidden under blue construction material, was one of the most recognized pieces of public art in Portland. Chris Denison painted the mural, which was at least the second mural in the building’s modern history. His mural loosely depicted the old U.S. post office that had been across the street in what is now Post Office Park, and it replaced a mural that went up in the 1970s. The deadline for applying is July 15. Hutton hopes the call for proposals reaches a wide audience, although the committee that will select the artist will favor someone from Maine or with deep Maine ties. The request for proposals is purposefully vague, Hutton said, to encourage a range of ideas. Hutton hopes established and emerging artists apply. “It could be a seasoned professional or it could be a new artist who has an amazing idea and wants to use this as a canvas for a public piece of art,” she said. A committee of seven art and business leaders will judge the proposals based on qualifications and “fit for the project” of the artist or artist team, Hutton said. Artists who are invited for a second round of evaluations will receive a $500 design fee for refining their proposals based on the feedback of the committee. The committee will make its decision in October, and the winning artist will be announced in November with a First Friday Art Walk celebration. The actual work to replace the mural will begin in the spring, with a goal of finishing the project next June. The composition of the review committee is still coming together, Hutton said. The design should fully occupy the wall, which at its highest point is 57 feet tall. It’s 59 feet wide. The mural should last at least 15 years and will be judged on factors that include artistic merit and quality; local significance and its ability to create “a sense of excitement”; the artist’s ability to design work that is sensitive to social, environmental and historical contexts; and the artist’s ability to work on deadline and within a budget. The proposed budget will be a significant factor, Hutton said. The proposal must include an estimate of costs associated with the project, including design fees, materials, labor, travel and other expenses. The call for art suggests the budget should be between $40,000 and $80,000. That budget range is in line with other, similar privately funded calls for art, she said. Fathom Cos. formed last fall with a dual focus on hospitality management and real estate development. The company will focus on renovations and repositioning existing properties. James Brady, who helped develop The Press Hotel and hired Hutton to curate the art in the hotel, is one of the principal partners in the company. The building at 80 Exchange St. was constructed soon after Portland’s Great Fire of 1866.